Need more information about booking Home 430449 ? Woodpecker Cottage is a new, stylish holiday home with a WOW factor, accommodating up to 4 guests in two bedrooms and affords spectacular views over the lake and fells. Furnished and equipped to a high standard of comfort and style, you step into the spacious contemporary open plan double height lounge area with attractive beams, kitchen and dining area displaying the spectacular views through large patio windows. The family bathroom and bedroom 2 are also located from the ground floor. The master bedroom with ensuite is upstairs with views to the lake over the mezzanine balcony. A large patio to the front of the Cottage allows you to take full advantage of the sun and gives you plenty of space to relax or dine al fresco; a barbeque is also available for your use. You can relax in the hot tub on the terrace and enjoy the vista. We pay attention to detail to ensure your stay is enjoyable and stress free, whatever kind of holiday you are planning; walking, sight seeing, cycling, trekking or just plain relaxing, you will find the perfect home from home here. We had an amazing 2 nights, wished we could've stayed longer! Lovely cottage and facilities, gloriously tranquil outside space, made even more amazing when sitting in the hot tub all evening. We will be back - thanks guys! 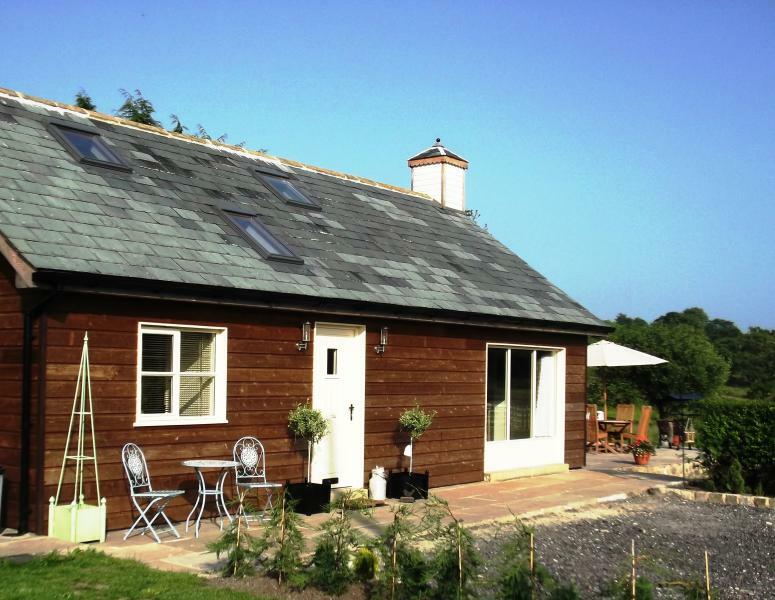 Wonderful peaceful setting in this lovely cottage surrounded by wildlife. The hot tub was lovely to relax in and the only disappointing thing was let down by the weather. Cottage is equipped with everything that you require and Rob and Sally go out of their way to provide excellent customer service. This is a lovely place to stay with everything you could need and more! The setting and hot tub are nice too! A beautiful cottage which is well looked after and in a great spot. Very comfortable and was not overlooked at all when using hot tub. Owners were very helpful and friendly from booking onwards. Hope to return!! Beautiful modern cottage in countryside. Perfect place for a quiet weekend away. Hot-tub was simply superb! Warm welcome with fresh eggs was a nice touch as well. Plan on coming again. Only negative was that the bed was too small for me (6ft 4 tall) but that is a problem in most places. fantastic cottage in ideal location in froest of bowland and for trios to coast / lakes. High quality and great jacuzzi. Very private and not overlooked. You can get in touch with Sally (the owner) through the contact form on this page. Send Sally (the owner) an email through the contact form on this page. Alternatively, if there’s a phone number on this page, you can call them. How do I contact Sally (the owner)? You'll need to send Sally (the owner) an enquiry to book - the owner will let you know how to pay. If they accept online booking they'll send you a quote and info on how to pay. If you pay through our website you’ll be covered by Payment Protection. Or you can send Sally (the owner) an enquiry through the contact form to request a quote. Sally (the owner) will email you the total cost for your dates and how to pay. Send Sally (the owner) an enquiry through the contact form requesting a quote for your holiday dates. Sally (the owner) will email you the total cost for your dates and how to pay. Sally (the owner) of this property is responsible for taking and refunding your damage deposit. The damage deposit terms should be agreed before booking and outlined in the booking contract, if Sally (the owner) supplies one. Please refer to these details or contact Sally (the owner) directly if you have any questions. You'll need to contact Sally (the owner) to cancel. They should have provided their contact details when you made your booking - otherwise, email them through the contact form. You'll need to contact Sally (the owner) to edit your booking. They should have provided their contact details when you made your booking - otherwise, email them through the contact form.